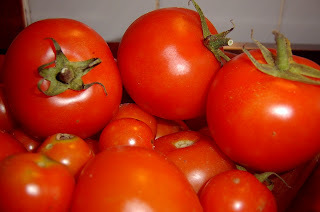 frankly my dear...: From The Patch - Tomatoes. The last couple of years we have had good crops of tomatoes - which is great because there is a lot of things you can do with them. They are especially nice on toast with a bit of salt & pepper.....mmmm. Every year i make Oven-dried Tomatoes & a yummy Roasted Tomato Sauce, which is delicious as a pizza sauce or with pasta - especially gnocchi..............i'm drooling just thinking about it! (Think i have tomorrow night's dinner covered now). I don't use a recipe with measurements for either of these, they are both just something i have tweaked over the years. Place cherry tomatoes or larger tomatoes that you have quartered onto a baking tray. Roughly chop 3-4 garlic cloves & sprinkle over tomatoes along with fresh basil, oregano & rock salt. Drizzle with olive oil. Place in a very slow oven & cook for a few hours until the tomatoes are slightly blackened. The smell of these cooking is divine! I store these in the fridge in a container with the oil they were cooked in. So, so yummy! Line a tray with cherry tomatoes or roughly chopped larger tomatoes, sprinkle with rock salt & then drizzle with olive oil. Bake the tomatoes in a slow oven until they skins have blackened. Allow to cool & place in a processor with 2-3 garlic cloves, fresh basil, oregano, a dash of balsamic vinegar & sprinkling of sugar. Blend to a smooth sauce. If you don't use this immediately, you can keep it in the freezer. *I must also note, that i do not take any credit for the produce that comes from The Patch - The Bloke takes care of all that, i just pick stuff every now & again. I can only take credit for what becomes of the produce in the kitchen. sound yummy! Your tomatoes look really yummy too! !